The AZ10LVEL11 AZ100LVEL11 is a differential 1:2 fanout Gate The device is functionally similar to the E111 device but with higher performance capabilities. Having within-device skews and output transition times significantly improved over the E111, the AZ10LVEL11 AZ100LVEL11 is ideally suited for those applications that require the ultimate in AC performance. The differential inputs of the AZ10LVEL11 AZ100LVEL11 employ clamping circuitry to maintain stability under open input conditions. If the inputs are left open, the Q outputs will go LOW. NOTE: Specifications in the ECL/PECL tables are valid when thermal equilibrium is established. By Arizona Microtek, Inc. This is one package pinout of AZ100LVEL11,If you need more pinouts please download AZ100LVEL11's pdf datasheet. 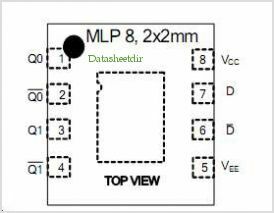 AZ100LVEL11 circuits will be updated soon..., now you can download the pdf datasheet to check the circuits!